As a community, we believe that we have the ability to inspire a nation, to turn the fitness world on its head, and to truly find alternative ways to ROCK. We aspire to change minds before bodies and use beat and alternative movement to launch people to new heights of self worth, happiness and human connection. AKA, release their INNER ROCKSTARS. 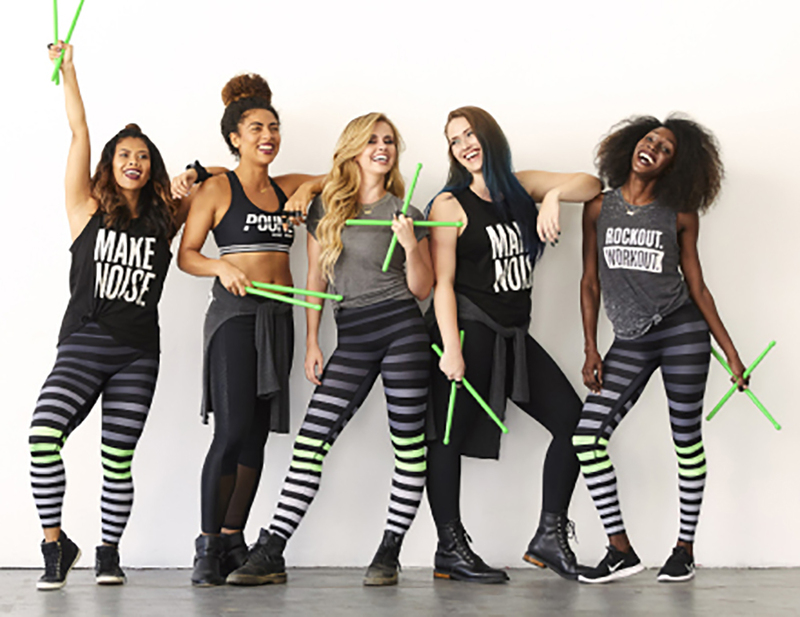 POUND® was created in 2011 by two women who were both recreational drummers and former college athletes. They relied heavily on stability-based exercises like pilates to keep their bodies aligned, symmetrical and lean, but were bored with routine and longed to reignite the fun in exercise. It wasn’t until they were forced to drum without a stool and squat over the drum kit that they realized drumming and exercise could be one and the same. Led by co-creator and CEO, Kirsten Potenza, POUND® is currently taught by over 17,000 instructors in 70+ countries to hundreds of thousands of participants a week, making an active, supportive and passionate community. Numerous studies have proven the powerful brain-boosting, stress-relieving effects of drumming. The rhythm of drumming permeates the entire brain to improve focus, increase higher-level thinking and decision-making skills, boost the immune system, lower blood pressure, decrease chronic pain, anxiety, and fatigue. You’ll burn up to 900+ calories per hour, strengthen and sculpt infrequently used muscles, and drum your way to a leaner, stronger physique – all while rocking out to your favorite music! You’ll drastically improve your rhythm, timing, coordination, speed, agility, endurance, and musicality. Instead of counting reps or keeping track of the clock, POUND strategically distracts you from the high-intensity and duration of your workout, and shifts your focus to rhythm and volume. This strategic distraction is responsible for the “addictiveness” of POUND – the reason you can’t stay away! GIVE US SOME INFORMATION & WE WILL CONFIRM YOUR SPOT. DOWNLOAD THE MITCH’S GYM ANDROID APP HERE. or DOWNLOAD THE MITCH’S GYM I-PHONE APP HERE.